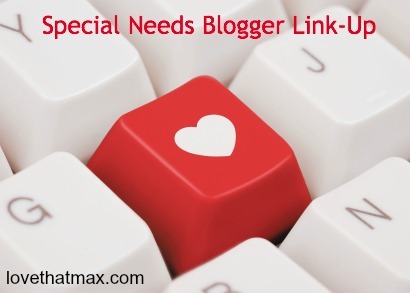 Love That Max : Special Needs Blogger Weekend Link-Up: You in? Here we are, another weekend link-up for bloggers with kids who have special needs. As always,Ellen, you rock! Thank you for taking the time to organize this every week and give us all a platform to share our thoughts. So glad you and the family enjoyed your vacation!! This has become my Friday afternoon retreat. :) A chance to connect with other moms. This week we celebrated 1 year since we downloaded Maya's communication app, and I wrote an anniversary post (at Uncommon Sense). i think i did. i just wrote today about my daughter's deafness (and the constant suggestions that we get her cochlear implants, or watch youtube videos where children get cochlear implants....). Great way to network! Love it! I can't do this on my blog because wordpress doesn't run java script (or at least that's what Mister Linky says), but it is really great! Have a wonderful weekend, Ellen! Thanks for hosting, Ellen! I look forward to reading many of the posts shared here this week! I finally touched a little on employment/disability, springing from a great post coming earlier this week from another blogger (linked in my post). And still planning on the (free) e-book (s) that will cover this very important subject. I keep seeing your name everywhere, Ellen! Keep up the good work, speaking for all of us! And thank you for the link up - You have fantastic readers! This is my first time participating - thank you for creating a wonderful opportunity for bloggers to share their stories :)! Thanks so much for bringing us together, Ellen. It's wonderful to learn from and support each other! Grateful that you make that possible. Have a wonderful week! Ellen, we follow you from Colombia and Love that Max has been an inspiration for starting my own blog(in spanish). You helped me confirm that Sofi (my 7 years old daugther) and me could help other families in similar situations just by sharing experiences, information, etc. like you do. Thank you for the opportunity to share my blog and my experience.